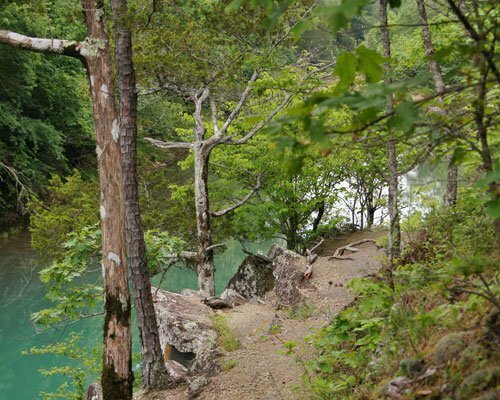 Set amidst the Kiamichi Mountains in southeastern Oklahoma, Eagle Creek Escape offers couples a unique getaway. As Smithville's premiere couples-only destination, these cabins offer top-notch amenities, beautiful creekside or lakeside views and a relaxing setting for a quiet, romantic stay. 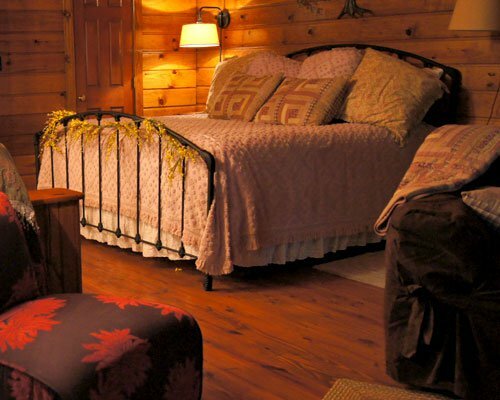 Six creekside cabins are available as well as six lakeview cabins. Each cabin features a spacious deck, full kitchen, central heat and air, king-size beds, TV, CD player, hot tub and more. During your stay at Eagle Creek Escape, for a fee, you can also enjoy services including fresh roses, a couples' massage, DVD rentals and Internet. The Lost Creek Cabin was modeled after the Ponderosa in Virginia City and is beautifully decorated. You'll have access to a fully equipped kitchen, an outdoor hot tub on a deck overlooking the creek, a Jacuzzi, matching bath robes, a fireplace and deck with Adirondack chairs. 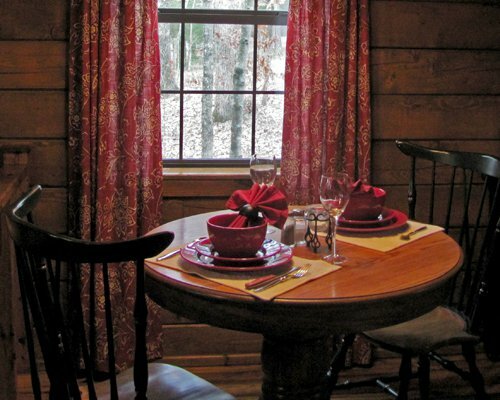 At Lover's Leap Cabin, you'll get all of the same great amenities. It is the only cabin where the bedroom is separate from the living area and has a "all in one" shower unit. It can function as a two-person Jacuzzi, a steam shower, a dual handheld shower or a rainfall shower head, whichever you prefer, and has an amazing view of the forest. The double back deck of Eagle's Nest keeps regulars coming back again and again for a weekend at Eagle Creek Escape. You can also enjoy the charcoal grill and fix some delicious burgers, and the fire pit next to the creek is a great place to cuddle up on chilly autumn nights. 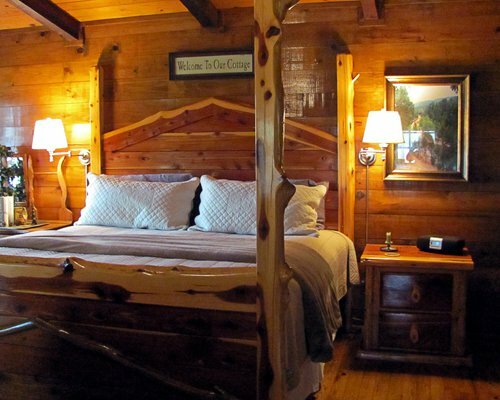 You're sure to sleep comfortably in the four-post cedar bed. Designed as a honeymooners cottage, the Deer Creek cabin offers a free standing shower and a hot tub for two. The chandeliers and other luxurious decorations will make you feel like royalty while you enjoy your vacation away from it all. Whether you're just married or have decades of experience being partners, it is an ideal getaway. The native stone fireplace and bi-level floor plan of Creekside Perch make it a charming choice for your romantic stay. Near the rapids of Eagle Creek, you'll enjoy the fantastic view from the comfort of the double deck porch with a spa. Cliffside offers a panoramic vista of the Kiamichi Mountains which can be seen from the deck with a spa or the Jacuzzi tub situated in a bay window. The porch swing and fire pit offer plenty of spaces to relax and enjoy the weather in the spring, summer and fall. 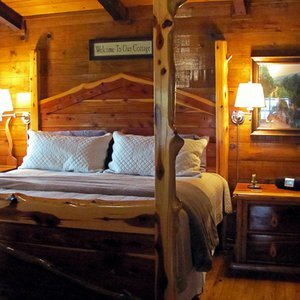 You'll find yourself in the lap of luxury in Wishing Well Cabin as you snuggle into the leather furniture around the fireplace and admire the beautiful black four poster bed. This cabin's Jacuzzi tub faces out a bay window with a view into the forest. It's location next to Spring Lake is an ideal spot for a memorable weekend. 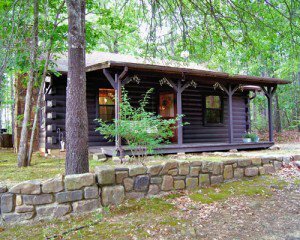 The Wild Rose cabin has it all with its popular shabby chic decor and large outdoor porch with a hot tub. It gets its name because a Western settler once lived in the area and planted roses. Stay a while and get comfortable on the porch swing or whip up a delicious meal in the full kitchen. You can walk to the lake from Barefeet Retreat Cabin before or after enjoying all of its amenities. You won't want to leave the fireplace, fabulous deck, relaxing hot tub or king sized bed behind when its time to check out. The Spring Lake cabin is named for its position in the trees just above the lake. Head down to the shore to enjoy the sounds of the lake's waters lapping around your feet or relax for a while in the rocked rain shower that comes only with this cabin. 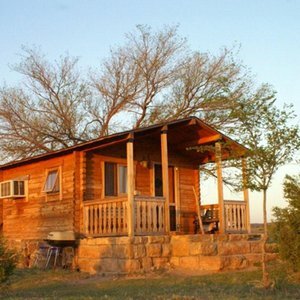 Oklahoma sunsets shine their brightest from the large front porch of the Double Dove cabin. Adorned in the lavish style of the Victorian era, this beautiful cabin is tucked away in the woods and features every top amenity including luxurious linens and a Jacuzzi. Eagle Creek Escapes' only two story cabin, the Treehouse Loft, has charming features that make it unlike all of the others. The romantic bedroom is upstairs in a separate loft that also features a two person Jacuzzi. Take a short walk and sit on the bench at the end of a dock that extends out into Spring Lake. Most stays require a two night minimum, although one night stays are available with prior approval for an additional $30. While every effort has been made to ensure the accuracy of the pricing listed above, prices are subject to change without notice.